Well, this is California and earthquakes are going to happen when you least expect them. I had left my gym after a good workout and was in my car and it started to rock very gently back and forth about 9:30PM. I was parked on the second floor of the parking structure of the same building that is home to the famous Cinerama Dome on Sunset near Vine Street. I knew it was an earthquake and it’s epicenter was far away, because had it been close, the shaking would have been extremely violent, perhaps deadly. My first instinct was to think about the possibility that the structure would collapse and what I would do to save myself from the tons of concrete that would drop onto my car. As the ground continued to shake for about 1o seconds, I looked around at other people walking to their cars and saw no reactions. What’s wrong with these people I thought; all stupidly so unaware. 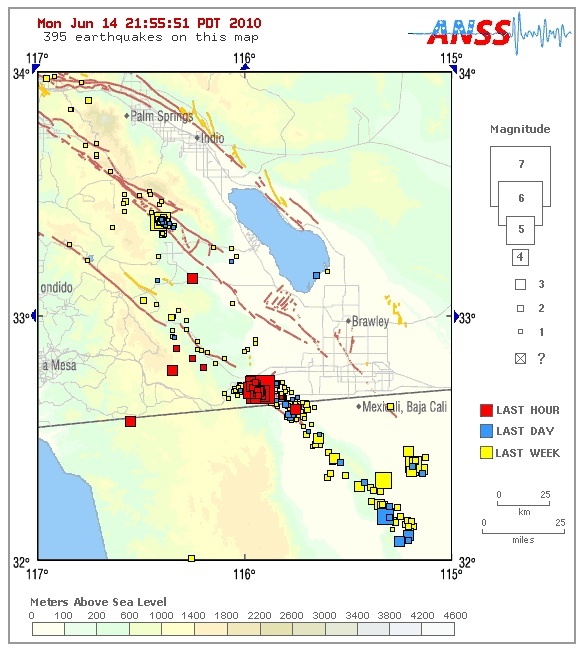 It was centered near Ocotillo, south of Palm Springs and right on the Mexican border, it was a 5.7. Not huge and not little. No reports of major damage or injuries. This was considered an aftershock from the large 7.2 earthquake that struck in Mexicali on April 4th. Just a warning that the planet is going to rock Los Angeles and my world really soon. Dude, leave before Kahleefohnya turns Nevada into beachfront.